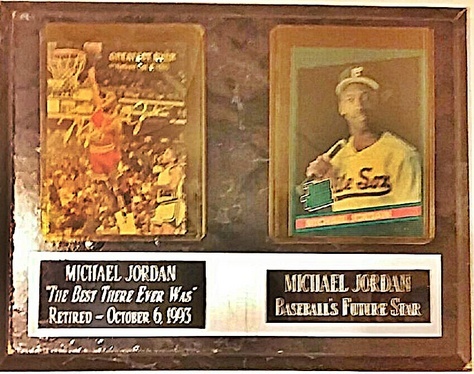 These are mounted cards from 2 Michael Jordan: the retired basketball player SIGNED BY HIM and a young baseball player Jordan presented as a future idol. Both are mounted together on a wood base with the names on metal plaques under the cards. The mounting has some age-worn defects in the wood, and the acetate plastic protection of the cards is broken on the top for to be taking out.